Are you looking to buy the best tactical knife available? our in-depth guide has been written to answer all your questions and provide our top recommendations. As buyers we are presented with so many types of tactical knives on the market, it’s understandably difficult to make an informed choice about the best option. In order to make your buying decision easier, it’s best to consider the following questions. How much do you want to spend? Do you want a fixed blade or folding knife? What do you want to use the knife for? If you’ve bought knives in the past, then you might prefer to buy something for a specific brand or manufacturer. You might also want to buy something which is a particular color or looks a particular way. Other buyers prefer to make their buying decisions on the knives specs, blade material, length or the type of handle. These are all legitimate wants, there is no right or wrong way to buy a knife, as long as you’re happy with your purchase and that you feel you’re getting a knife that best meets your requirements, then that’s all that really matters. What’s the Difference Between a Tactical Knife and a Regular Knife? When we began reviewing and researching tactical knives, we quickly came to the conclusion that the definition of ‘tactical knife’ was quite open to interpretation amongst knife manufacturers. Some so-called ‘tactical knives’ were little more than gimmicks, while another manufacturers ‘survival knife’ would make an ideal tactical knife. To help us better make recommendations, we’ve created some criteria that will help us define what a tactical knife is and isn’t. These aren’t hard and fast rules, more things to bear in minds when choosing your next tac knife. It’s not at all surprising that most people can’t tell the difference between a pocket knife and a tac knife. The actual differences can be rather subtle and not at all obvious. The main differentiator is the purpose. If the knife has been designed and built to meet a specific need then it can probably be classed as a tactical knife. Special forces, SWAT, EMTs and Police Officers may carry knives that have been made to meet a need, these will be classed as tactical knives. In fact, these professionals may, in fact, carry more than one knife to meet more than one requirements. The founder of Spyderco has been quoted as saying “a tactical knife is any knife you have with you when you need a knife”. I think this is a fair definition, with one caveat, as long as the knife performs the job what you want it to do. If you’re required to cut some canvas away and the blade snaps on the first attempt, then this is failed tactical knife, it’s not done its job. In knife terms, the ‘tang’ refers to the sections of the blade that extends into the handle of the knife. There is more than one type of knife tang, with the various types offering certain advantages or disadvantages. The best is arguably the Full tang, which means the tang extends down the full length of the knife. Half tang and its variations normally extend about halfway into the hande or less. These are weaker than full tang are normally present on cheaper knives. If you can, only consider full tang knives as the extra length equates directly into a safer, stronger and more reliable knife. However, tangs do not apply to folding knives. Knife handles can be made from a variety of materials, both man-made and naturally occurring, including horn, bone, wood, rubber, and leather. For a tactical knife, we would always suggest opting for synthetic materials, as these will generally offer the best grip and toughness you’d expect from a tactical knife. Other materials may look nicer, but when it comes down to hard use they might not be up to the job. We can quite roughly divide knives into two categories, fixed blade, and folding knives. Foldings knives are as the title suggests, knives that fold and can include pocket knives as well as numerous other types of folders. The folding knife market is heavily saturated with many manufacturers and vendors providing a myriad of options. The most common types are multi-bladed, double-bladed, single-blades and Swiss Army style. These can range in size from something the size of your fingertip all the way to something that would only fit in a bag. Most folding knives are made with portability in mind, either designed to fit comfortably in a pocket or a tactical pouch. Fixed blade knives are as suggested by the name, fixed, unable to fold or reduce in size. They are generally stronger, more durable and thicker than any folder. You can, of course, use a folding knife to butcher a bear, but the right tool for the job is a fixed knife. Common examples of fixed blade knives are camping and hunting knives, survival knives, skinning knives and gut-hook knives. The biggest disadvantage of a fixed blade knife is portability, they are seldom convenient enough to take with you everywhere, and remember the best knife is the knife you have with you. I’ve always been of the opinion that you get what you pay for, meaning if you want a serious piece of kit, you’ll need to pay a little bit more for the privilege. There are a ton of cheap $5 knives available to buy online, and they can be a bit of cheap fun, but if you intend to use your tactical knife in any practical way, I would suggest spending at least a little more in order to get something that’s not going to fail on you. 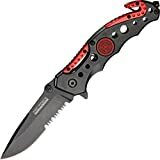 We have attempted to cover every budget in our recommended knife range, with some dirt cheap options that are reasonably competent, but if your budget stretches to $40 or more, then the quality of knife you’ll receive is much better and you’ll end up with something that will last years or decades of use. Along with build quality, ergonomics is one of the features of a knife that needs to be well thought out and seamlessly implemented. You need a knife which feels comfortable in the hand even when put under stress or during a long session of use. The knife should feel natural in the hand and no sharp edges or pinching should be felt when the knife is in yes. You ought to feel confident in its use, with no concerns or worries about losing your grip. Experienced designers and manufacturers will ensure a knife meets and exceed these criteria. When you receive your knife, make sure it fits snuggly in your hand and it’s not too small or too large, if it feels uncomfortable and just doesn’t feel right, return it and choose another model. A big knife does not necessarily mean it’s a better knife. A knife choice should be driven by the purpose you intend to use it for, remember the best knife is the one you have with you when you need it. A machete might be a great choice if you need to hack your way through a Bolivian jungle, but it’s going to useless if you don’t have it with you due to its size. That’s not to say that big knives don’t serve a purpose, they certainly do, but a tactical knife doesn’t need to be big, it needs to be portable and something you can carry with you everywhere you go. On a tactical knife, there are two areas of interest when it comes to materials used, these are the blade and the handle, Blades can be made from a massive selection of steels, and it’s incredibly difficult to say one particular type is the best. Each type generally offers various advantages and disadvantages, so it becomes a task of picking the steel that best suits your needs. Steel is largely made up of two main components, iron, and carbon, in addition, other elements can be added to change the properties of the resulting steel. Most blade steels contain additional elements such as phosphorus, silicon, manganese or sulfur, this creates an alloy that might make the resulting blade harder, more resistant to corrosion or better at taking an edge. Any decent manufacturer will use quality proven alloys in the construction of the blade, just be wary of knife offerings from China or Pakistan, they might not be made to the standards we expect in the west. Carbon Steel will generally have a carbon content between 0.5% through to 0.95%, the higher the carbon content, the harder the resulting blade will be. However, they can be brittle and they can rust if not cared for correctly. Stainless steel is available in a huge range of grades, some are better suited to pots and pans rather than knives, be sure to verify the hardness of the stainless steel prior to making a purchase. Just because the steel is resistant to corrosion, it doesn’t mean it won’t rust and it doesn’t mean it’s the best choice for you. Titanium will usually come alloyed with carbon. It can be great when used to coat another metal type, for example, steel, but it’s often too flexible for a knife to be made purely of titanium. The exception would be if you needed a flexible knife, for example for filleting. Damascus steel is often nothing more than a marketing gimmick and is rarely found in its true form. It’s often confused with folded steel, which it does share some similarities. I would recommend avoiding anything marked as Damascus steel unless you’re looking for something that’s nice to look at and will only be used as a display piece. Knife handles can come in a huge range of materials, including Steel, Aluminium, plastic, wood, bone, G-10 and rubber. The perfect handle is comfortable, natural feeling and provides exceptional grip under adverse conditions. Give some thought to the environment you’ll be using the knife in before deciding on a purchase. Wood and bone might look nice and make a great gift, but if they’re subjected to oil, sweat or intense heat, they are likely to crack, break wear loose. From a tactical point of view, I would suggest sticking with synthetic materials. Steel, G10, Titanium and Aluminium all make good choices. Any handle that feels natural, suits your grip and handshape is going to make a good choice. Below we’ve listed some of the popular handle options available. If you’re considering a wooden handle, then hardwood is really the only viable option. I will admit that I love the combination of wood and metal, however, from a tactical point of view, I would suggest another option. Similar to wood, Horn is another popular option for certain types of knives. Again, aesthetically they look great and would be a great choice for a skinning or hunting knife, but I would choose something else for my tactical tools. ABS is a common choice at the lower end of the market, it’s incredibly hard wearing, tough and cheap to produce. If exposed to direct sunlight for too long it can become brittle. It’s also not particularly grippy, especially when wet. Choose something else if you can. Bone is commonly available as a handle material, it can be quite grippy due to its rough nature, it can be dyed to almost any colour you can think off. For a tac knife, I wouldn’t recommend it. Paracord for a handle presents an interesting option. it can serve the dual purpose of providing a good grip and can additionally provide a length of paracord to be used in case of an emergency. It’s potentially a good choice. Metals such as titanium, steel or aluminium are very popular for tac knives. It’s hard wearing and can provide an excellent grip if treated correctly, I would recommend. G10 is probably the best choice for a tac knife. It’s very grippy in all conditions, whether wet, dry or cold, it’s additionally very comfortable to hold and use. Definitely recommended. At their most basic level, knives are simple designs consisting of a sharp edge and sharp point, that’s all their is to them. As designs became more complicated over the years, the shape and style of the blade began to take on distinct names. These designs were primarily made with a specific purpose in mind, allowing for increased specialisation for the knife in question. If you need to poke something, then theirs a blade design to match, if you need to pry, then theirs another matching design. Many designs exist today, but the two most commonly found are drop point and clip point. Tac knives are available in a variety of blade styles, from Tanto point to spear tip and everything in between, they all specialise in fulfilling a specific need. The blade edge can be plain, serrated or a combination of the two, half serrated half straight. My own personal preference is a thick blade with a drop point and half serrated edge, this means to knife can be used for a variety of purposes and I won’t feel like I’m carrying around something flimsy. This is, of course, a personal preference, so feel free to pick something that better suits your requirements. A straight-backed blade is perhaps the most common type you’ll come across. Its telltale design includes a flat back and it will normally boast a curved edge. The flat back is often an advantage, allowing the user to exert extra pressure with their other hand. It’s a great option for most knives. A clip-point blade looks like a normal point that’s been clipped at the back, creating a thinner and pointier tip. It’s ideal for precision cutting or when additional control is needed. The legendary Bowie Knife is an excellent example of a clip-point blade. Clip-points can either be straight or concave. A trailing-point is easy to spot, featuring a back that curves up which improves the slicing capability. The curve is sometimes called the ‘belly’ and a knife featuring a large belly are especially well suited for skinning. As the blade curves, the blade is often lighter and more manoeuvrable. You’ll often find this style in fillet knives. A drop point blade is in some respects similar to a clip point, but while a clip point features a concave back, the drop point is convex. This design is not as good at piercing things, but overall it’s a stronger design. Many modern knives feature a drop point as it’s versatile and useful in most applications. A spear-point blade is common in daggers and other piercing weapons. It features a symmetrical design with a thicker spine running down the centre. These can either be sharpened on one side or on both. A needle-point blade is somewhat similar to a spear-point, but it’ll taper far more to create a much sharper point. The blade is often very sharp but not very strong. It’s commonly used in daggers. A tanto tip is shaped like a chisel and took its inspiration from Japanese swords, the advantage of this type of blade is the increased strength. It’s a great option for a tactical knife. There are tens if not hundreds of different types of steel available, and not all of them are good for knives. Going through every type of steel is a bit beyond this article, but we can generalise the common types found in knives and give you a rough idea of what to expect. Stainless steel is probably the most common type of steel used in knives today, it’s durable, resistant to corrosion and can make a decent blade. Within the stainless steel category, there are several grades, many of which create terrible knives, while others are great for knives. Make sure you get a stainless steel that’s good for practical purposes and is not best suited for a kettle. Carbon steel is a great choice for knife blades, they are strong, hard wearing, can take an edge really well and can last a lifetime. The downside is that they are prone to corrosion if not cared for carefully. Carbon steel blades need to be stored with a thin layer of oil or other protective substance to avoid rusting. The first among the best tactical knives in this review is Kershaw Blur S30V. You might’ve heard about the Kershaw brand if you’re into tactical gear, as they’re one of the world-class leaders in this field – this particular model is, perhaps, their finest creation in the tactical knife sphere, and we intend to show you why. Firstly, this knife features a folding mechanism it’s 4.75 inches long while closed and 8.25 inches long when opened. The half-serrated blade is 3.5 inches tall and features a premium stainless steel. The handle is made of black aluminum material and it’s just as durable as the rest of the construction. Nearly all features of the Kershaw knife are plain and very easy to use. The Kershaw Blur S30V folding pocket knife is great value for money – there are plenty of diverse features that can be used in any number of situations. The blade is decently long and boasts a clean nonserrated edge, making it ideal for both cutting and piercing. The easy-handle grip is also very durable, so it’s safe to conclude that the Kershaw Blur S30V Folding Pocket Knife is incredibly versatile. This tactical knife looks all but ordinary – it excels in aesthetics like no other. There are several “gaps” in the main graphics and the serrated side makes it look even more dangerous and edgy. When folded, the grip of this tactical knife is enough to make it pass as an “exquisite knife”, to say the least. People who are looking for beautiful tactical knives shouldn’t skip this model. Ironically, the Kershaw Blur S30V Folding Pocket Knife doesn’t cost a fortune, even though it offers a plethora of benefits and advantages over similar tactical knives. It belongs to the “affordable” price point category and boasts a massive value for the buck. Firstly, the mechanism of Kershaw pocket knife is impeccable – it locks in easily and neatly. The blade is very sharp and retains its edge well, but what we really liked about this tactical knife is that it comes it feels like it’s up to any job you might throw at it. 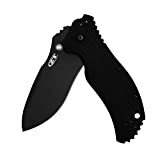 On top of that, the Kershaw Blur S30V Folding Pocket Knife is great value for money and is easily comparable to knives which cost twice as much. The only problem we had with the Kershaw Blur S30V Folding Pocket Knife is that it doesn’t close as easy as it opens – you’ll need to be a little rough with it until you get accustomed to it. Much like our previous pick, the Ruger 2-Stage Compact Folding Tanto Veff Serrated Edge Knife is a beautiful, highly versatile tactical knife. It comes outfitted with a sizeable blade and, even though it doesn’t have the features of other models, it can still prove to be useful in any number of situations. The Ruger features the military grade handle – it’s very grippy and comfortable, making this knife extremely easy to use. The spring-assist mechanism will help you lock your knife in our out quickly. 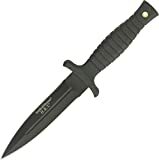 This tactical knife is 9 inches long when opened and 5 inches long while closed, with the blade being four inches long. The half-serrated side works like a charm in situations when you need to cut anything heavy or durable while the tanto point makes Ruger 2-Stage knife is excellent for piercing things. Lastly, the bottom of the grip is reinforced with metal, allowing you to use this tip for breaking glass safely in rescue situations. The Ruger 2-Stage Compact Knife is decently versatile – it features a glass breaker on the hilt, a serrated edge, and a superbly sharp edge. You could use it for self-defense, for cutting, piercing, and breaking in a nutshell – there are more versatile models in our review, but this one passed the basic versatility checks. Basically, the Ruger looks incredibly pretty – it’s available in a few color variations, including black, desert tan, and stonewashed. Whichever color you pick, we guarantee that you’ll like this tactical knife in terms of aesthetics. Even though it’s not the cheapest tac knife in our review, the Ruger comes at a rather affordable price. It belongs to the medium bracket of the “affordable” price point category and boasts quite a value for the cash. The price of Ruger knife is the first thing you’ll like – it’s a cheap, highly versatile tactical knife that surpasses most similar knives in value. The military handle is the feature we can guarantee you’ll like, but you’ll also find much use of the serrated belt cutter and the window breaker. Some people point out that the spring assist mechanism is quite weak. That’s only partially true – namely, the locking (and unlocking) mechanism of Ruger won’t just “spring out” at the exact moment when you use it, but it works just fine. Here we have yet another great option, the Benchmade Bedlam 860 Scimitar Knife – the Spring assist open scimitar rescue pocket knife. This is more of a blade than it is a knife, as it’s very long, remarkably sharp, and outfitted with a razor-tipped point. As Benchmade makes some of the best tactical knife models out there, you should feel free to expect quite a lot from this one. First of all, the Spring assists open scimitar pocket knife is made of a special type of steel. It’s as durable as can be, and you can rest assured that you’ll be able to use it put it through several years of hard work with little worry. This knife operates on a spring assisted locking system which is a bit more reliable when compared to our earlier picks. The overall length of Benchmade Bedlam 860 is 9.7 inches while the blade is 4 inches long. This is a rough-looking knife, but that doesn’t mean that it’s not beautiful. People who are looking for elegant looking knives should, perhaps, continue browsing through our selection of the best tactical knives, but this one doesn’t lack in this field of performance, it’s just that it performs better in other spheres. The knife belongs in the “luxury” price point category but you’ll get a significant amount of money for that price. Apart from the low price and its tough-looking design, we really liked the material of which Spring assist open sawback bowie rescue pocket knife is made. The stainless steel is very durable, and there are a plethora of other features you’ll grow to love, like the glass breaker and the seatbelt cutter. While the majority of this knife’s construction is formed of stainless steel parts, there are several gaps in the design that somewhat impede upon the spring assist mechanism. WELL-DESIGNED: Benchmade's AXIS lock is exceptionally strong and fully ambidextrous. The Bedlam 860 is a manual knife that can be opened and closed single-handedly. We’re presenting to you Blade Mate’s tactical folding pocket knife – a neat, plain tac knife which is a bit smaller than from what we’ve seen so far. It excels in many fields of performance, but we can safely conclude that it’s usability is only matched by its outward appearance. Let’s take a look at what it can offer you. The first notable feature of Blade Mate’s Tactical folding pocket knife is the seatbelt cutter – it will undoubtedly save your life during an emergency. Secondly, there’s the steel tipped glass breaker which, when combined with the seatbelt cutter will be your mean of escape during car collisions. The blade of this knife features stainless steel materials and a serrated edge which is perfect for sawing and slicing. The blade is 3.5 inches long and is fortified with a quality alloy which prevents corrosion. Although Blade Mate’s Tactical folding pocket knife doesn’t come outfitted with too many features, it’s pretty versatile overall. This knife will prove very valuable to you during emergencies, during camping, or survival exercises. We’ve already mentioned that Blade Mate’s tactical knife excels in aesthetics, and the sole reason for that is quite obvious – you’ll be able to choose a plethora of color variations, including black, blue, cherry, covert black, pink, yellow, and the yellow box cutter. Blade Mate’s Tactical folding pocket knife is just a tad more expensive than our previous picks. It does, however, belong to the same price point category as most Tac Force knives in this review – the “affordable” price point category. Essentially, this is a beautiful looking knife – we’ve liked the diversity of color options that are at your disposal, but apart from that, it’s usability and versatility are pretty high as well. Basically, this particular model is a bit cheap feeling. Smith and Wesson are one of the most famous brands in the arms industry, and it’s of no coincidence that one of our top picks is a model from their assortment. The S&W SWHRT9B steel tactical knife is certainly one of the best tactical knives you’ll find in your search, so let’s delve deeper into details without any further ado. An incredibly long blade, the Firstly, the S&W SWHRT9B steel tactical knife will be your ideal weapon of choice out there in the wilderness or emergencies. You can rely on it in your time of need, as it’s made of high carbon stainless steel materials and wrapped with back rubber on the handle. This is a plain knife, which means that it doesn’t feature any spring assist or similar mechanisms. Firstly, the S&W SWHRT9B steel tactical knife is 9 inches long, with a blade with 4.7 inches – note that the blade of this knife is approximately 1.5 inches longer than what we’ve seen so far. This means that this knife is ideal for self-defense and hunting, and a bit less useful in regard to camping and survival situations. This doesn’t mean it’s not versatile, though, it’s just a bit more straightforward and plain than most models we’ve reviewed. As far as the story with plain knives goes, S&W SWHRT9B steel tactical knife is a classy, elegant knife. It looks just fine, although it doesn’t particularly excel in aesthetics. This remarkable knife costs several bucks above your average tactical knife – it belongs to the upper bracket of the “affordable” price point category, and it just might be one of the best tactical knives under $20. Plain is useful – if you agree with this statement, you’ll understand what we liked about S&W SWHRT9B steel tactical knife. It features a very long blade and it’s one of the most ideal steel weapons you could rely on. Most tactical knives are foldable, which is perhaps the only thing that we didn’t like about the SWHRT9B. Here we’re at a Tac Force tactical knife – the Tac Force TF 723FD assisted opening knife. It’s one of the cheapest knives we’ve come across in the Tac Force catalog, so if you’re looking for a budget option, this model might be perfect for you. Tac Force TF 723FD assisted opening knife is a spring-assist knife which is easy to fold, allowing for rapid deployment. It locks securely in place if you use the liner lock, and you can rest assured that you’ll be able to use it for years due to premium-quality stainless steel materials it’s made of. This knife features a half serrated edge, an aluminum handle, and a convenient pocket clip that allows safe & easy carry. It comes outfitted with a glass breaker, as well as the seatbelt cutter on the end, so it’s safe to say that it’s pretty versatile. Some people would say that Tac Force TF 723FD assisted opening knife looks more like a cork opener rather than a tactical knife, but that depends on how you look at it. When folded, it doesn’t really look that appealing, although the story is drastically different once you unfold it. This outstanding tactical knife comes at a shamefully low price – it’s one of the cheapest tactical knives in our review. 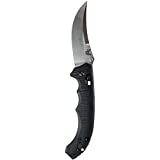 Firstly, we liked the price at which Tac Force TF 723FD assisted opening knife comes at. Though cheap, it’s also very durable and decently versatile due to convenient features it comes supplied with. Actually, if we take into consideration that Tac Force TF 723FD assisted opening knife comes at such a low price, there’s not a thing we didn’t like about it. By now it must be clear that Gerber makes tactical knives of exceptional quality, and if you’re really into this brand but are low on cash, we suggest that you give the Gerber 06 FAST Knife a shot. Let’s see what this quality knife has in store for you. Gerber 06 FAST Knife features a spring-assist mechanism which allows easy one-hand deployment. It’s outfitted with a liner lock which will keep it steady securely and surely. The 3.75-inch blade features a serrated side and a razor sharp edge and it’s made of 7Cr17MoV stainless steel. The handle is made of top-shelf textured G10, which is incredibly grippy. Nearly all Gerber tactical knives are exceptionally versatile, and this one is not an exception. It will be your ideal camping partner and it won’t fail you in heated situations where you’ll come to rely on it for self-defense. 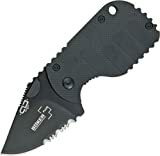 The Gerber 06 FAST Knife is available in an anti-reflective black coating. Simply put, this is one of the most beautiful knives you could possibly have. This tactical knife is one of the best value options in our review – Gerber 06 FAST Knife is not the cheapest knife available, but it it does offer incredible value for money. We warmly suggest that you try it out if you’re looking for a good quality tac-knife. Amongst the plethora of likable things about the Gerber assisted opening folding knife, we liked it the most for its sleek looks and spring assisted opening mechanism. It’s a beautiful-looking, reasonably priced, and very versatile knife which certainly deserves more attention than it’s already getting. Being cheap, it’s only normal that not everything is perfect regarding this knife. Namely, the hilt is pretty uncomfortable, although it’s very grippy. Benchmade makes some of the best regarded and well-loved knives ever made. This brand offers exceptional tactical knives, and the Mini Griptilian Knife is one of their finest works. This exquisite tactical knife features a custom drop point – it’s somewhat curved and performs better than most standard tactical knives in regards to self-defense and hunting. This knife is made of outstandingly durable stainless steel materials and comes outfitted with a G10 military handle which provides a massively superior grip. You’ll also get an adjustable belt clip. In essence, the Mini Griptilian Knife isn’t jam-packed full of (unnecessary?) features – it’s meant to cut and pierce things. There are no glass breaker or the seat belt cutter, which means that this knife doesn’t particularly excel in the field of versatility. However, it is a true everyday carry knife in a very handy compact package. It’s easy to open one-handed, meaning you can use it in a pinch. If you could only have one knife, this would be a strong contender for the best choice, given that you can easily take it with you everywhere. If you want to look tough, this knife is probably not the one to choose, it excels at functionality over the aggressive factor. It looks cool, works well and does everything you’d want a tactical knife to do. The Mini Griptilian Knife is one of the more expensive models in our review. In fact, it firmly belongs in the luxury price point category. It’s well worth the expense, though. I cannot recommend it enough. The looks, the attitude, the sturdiness of this knife – these are all qualities you’ll come to love about Mini Griptilian Knife. It’s incredibly durable, cuts through virtually everything as if things were butter, and even though it’s not the most versatile knife you’ll use, it’s an outstanding knife. Even if we were to look past the not-so-affordable price, the Mini Griptilian Knife lacks the versatility of its less-expensive counterparts. This is the only field of performance where this tactical knife is lacking in the end. WELL-DESIGNED: Benchmade's AXIS lock is exceptionally strong and fully ambidextrous. The Mini Griptilian 556 is a manual knife that can be opened and closed single-handedly. Here comes a fine tactical knife from Zero Tolerance – the Zero Tolerance 0350 Folding Pocket Knife with SpeedSafe assisted opening. It’s an extremely robust knife that will take a significant amount of punishment, from batoning, prying, camping, cutting and anything else you can throw at it, it’ll come through relatively unscathed. The Zero Tolerance 0350 Folding Pocket Knife is outfitted with a spring-assist mechanism and a liner lock – folding and unfolding it is as easy as pie, and you’ll be able to pull it from its sheath in a matter of seconds. 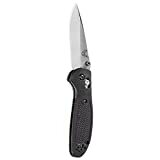 It also features black G10 scale handles, a pocket clip, and it’s made of S350V stainless steel which boasts impeccable levels of durability and sharpness. Coating the 3.25 inch blade is a Non-reflective black Tungsten DLC (Diamond-Like Carbon) coating. The only feature which contributes to the Zero Tolerance 0350 Folding Pocket Knife versatility is the pocket clip – it allows for safe & easy carry, which is perfectly fine, considering that this is, after all, is a significant practical tactical knife. As much as the Zero Tolerance 0350 Folding Pocket Knife lacks in terms of versatility, it more than makes up for with its beautiful outward appearance. It’s sleek, intimidating and looks the part. This tactical knife is absolutely perfect for people who need a quality knife that will last more than several lifetimes. It’s expensive, but we’re confident it’ll work out cheaper than most models given that it’s built to last. There is one thing we liked about the Zero Tolerance 0350 Folding Pocket Knife above all else – it’s incredibly sturdy build quality. As for the other spheres of performance, it is not lacking, but there are cheaper models that are nearly as capable. When compared to other tactical knives, the Zero Tolerance 0350 Folding Pocket Knife lacks versatility. It doesn’t feature the seatbelt cutter, glass breaker, or light, but it does what it’s supposed to, which to perform as a capable knife. This is the last tactical knife model in our review – Boker Plus Subcom Pocket Knife is perfect for people who are new to tac knives, as it’s very easy to use and doesn’t cost too much. Let’s see how it earned its place among the best tactical knives. 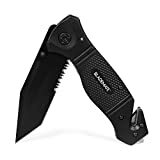 The Boker Plus Subcom Pocket Knife is, in essence, a plain fixed blade knife which comes outfitted with a small number of features, which include a half-serrated edge, an incredibly compact package and a reversible pocket clip. The level of versatility of the Boker Plus Subcom Pocket Knife is rather low – it’s perfect for people who are yet to get familiar with tactical gear, but it doesn’t do anything special in particular, apart from the fact that it will let you cut or slice your way through most things. This is, basically, a great-looking knife which offers and unique looks and feel. It looks pretty basic, and people who value minimalist knives will certainly like it – those looking for more flamboyant models should try something else. The Boker Plus Subcom Pocket Knife is very, very affordable – it belongs in the middle ground between cheap and luxury, but that’s not to say it’s not any good. It most certainly is a very capable knife. The price and beginner-friendly orientation of the Boker Plus Subcom Pocket Knife is what we absolutely adore about it. If you’re packing up for a camping trip or have found yourself in need of a new every day carry knife, make sure to consider this model. The blade of this knife is rather short, and there are absolutely no convenient features onboard – no glass breakers, no seatbelt cutters, so don’t expect a versatile knife. Truth be told, almost always these features are unnecessary, so don’t consider it as a fatal flaw.